Thank you for your interest in hosting a table at our Sunday Afternoon Tea at Houston Tea Festival! 20 Points will be awarded to your Mugworts House! 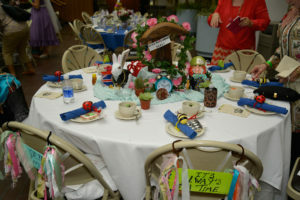 A table host is responsible for decorating a table and choosing a theme. The host provides table decorations (centerpieces, etc. ), and settings (place cards, tablecloth, place settings) in keeping with your table theme. Some table hosts choose to bring their own dishware to match their table theme, and some give their tablemates small gifts and party favors, although neither of these is a requirement. Last but not least, a table host’s most important job is to make everyone at their table feel welcome and introduce conversation topics if conversation lags or if someone is looking left out! A Table Host is in charge of pouring the first cup of tea, but he/she can delegate that to someone else at the table. We plan to have 3 types of hot tea already made in large dispensers placed at a service station for the hosts. As host, you may want to bring 1 to 3 teapots fill from the dispensers and serve your guests. The hotel will provide glasses and ice for water and iced tea. The waitstaff will be serving the water and iced tea as well as the food, and they will be busing the tables. Our festival theme is “Harry Teapotter and the Perfect Cuppa”. You may choose to do a Harry Potter™-themed table, but you are not required to do so. The hotel is providing 72-inch round tables that seat 10 people (you and 9 guests). The tables have polished silver steel tops. Linens are NOT provided by the hotel. Therefore the host will need to bring a tablecloth to fit your theme OR work the steel table top into your theme. Many table hosts choose to bring their own china, dishware, silverware, napkins, teapots, cream and sugar sets, etc. to fit their theme, but this is not required. If you prefer, you can request to use the hotel’s dishware and flatware, which will consist of stainless steel flatware, white dishware, and white mugs. Charger plates are pretty, inexpensive and lightweight and can be purchased at any Michael’s, Hobby Lobby, Pier One, Bed Bath & Beyond, Tuesday Morning, At Home/Garden Ridge Pottery types of stores. If bringing nice China or dishware, cover it with disposable plastic plates! This will protect your dishware from damage AND will keep it clean so you don’t have to do dishes when you get home. You can also use plastic plates to cover your charger plates and leave the china at home. Some hosts purchase inexpensive teacups and saucers at dollar stores or resale shops and give them as party favors to their table guests. Guests can then use the teacups to drink from at the afternoon tea and take them home afterwards as a nice souvenir of the event. And voila! Less for you to pack up! You will have up to 90 minutes to decorate your table. Since the afternoon tea runs from 2PM to 4PM, you will have access to the ballroom starting at 12:30PM on Sunday, January 28. Please have your table set up by 2PM so that the judges can start judging. Once the afternoon tea has ended, you will have 2 hours to pack up. The Atlantis Ballroom is conveniently located just to the right of the main entrance to the hotel. You can pull your vehicle up to the front to unload, but please move your vehicle once you have finished unloading. The hotel will have some luggage carts available, but probably not enough for all table hosts to use all at once. You may want to bring a small cart or dolly of your own. We will email you the week of the festival with an updated headcount and names of the guests at your table so you can make place cards or name tags for your table guests, etc. if you choose. Lone Star Houston Tea Festival, Inc. and Hilton Hotels are not responsible for any damages or losses incurred to items brought to Afternoon Tea by table hosts.